Last night, while prepping out a cheese souffle for dinner with my fiancé, I realized how much pleasure I get out of whisking egg whites by hand. It, like whipping cream, is a task that has been made much more simple by the invention of electric hand mixers and stand mixers. I myself used to make mayonnaise and whip cream and egg whites in my stand mixer. It's so simple - place the ingredients in the mixer bowl, flip a switch and let the machine do the work for you. Since completing studies at The French Culinary Institute, I no longer use my stand mixer for any of these tasks. It's either a result of being forced to do it by hand while I was in school, or the discovery that it is just not that difficult. I am not claiming that it is the easiest thing you will do in the kitchen this week - it certainly takes some elbow grease and a bit of patience - but the satisfaction I get from the finished product is increased ten fold when I use that elbow grease and make it happen myself. To make the task a bit easier, make sure you have a balloon whisk - an essential tool for whipping ingredients by hand. The large spherical center of the balloon whisk helps to incorporate air into mixtures more quickly than a standard whisk. You also need to put the cream or egg whites in a large bowl so that you are working with a large surface area. If you use a small bowl with a large amount of liquid, you are going to be whipping forever. Good for your arm muscles, not so good for enjoying the process. It is definitely a non-essential tool, but isn't it beautiful? 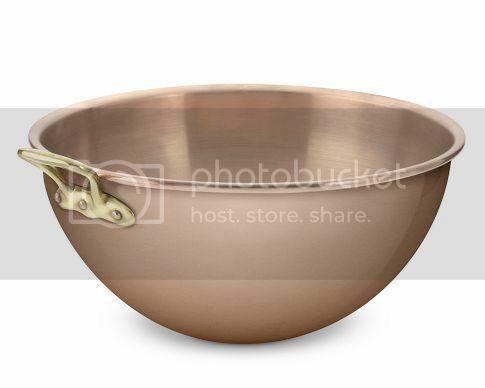 If you feel like splurging, you can buy this bowl here from Williams-Sonoma. I recently added it to my wedding registry in hopes that someone will splurge on me! Balloon whisks are available from many retail outlets, but again, Williams-Sonoma carries a great selection. This whisk is an affordable, well-made option. I have a huge problem with non so essentials kitchen tools. I get so sucked in by them. This just inspired me take stock and clean out all the stuff I don't really need. Looking forward to seeing the videos! I use my stand mixer for everything it seems so hopefully this will inspire me to get back to doing things by hand - especially with that beautiful bowl. I really like your blog, it looks very nice, I'm happy to visit again and again to see your blog because it is very good indeed and very nice, thank you for all this I really hope to be your friend. Oh, how I adore Mauviel. I managed to find an excuse to buy a big Mauviel soup pot last year, and it makes me happy every time I look at it. I'm very glad tu be your 300 follower in this fantastic glog. This is very essential tool for kitchen.I used to make mayonnaise and whip cream and egg whites in my stand mixer. It's so simple - place the ingredients in the mixer bowl.this is important for cooking. These tools are looking gorgeous. I like Golden bowl, it looks so nice !